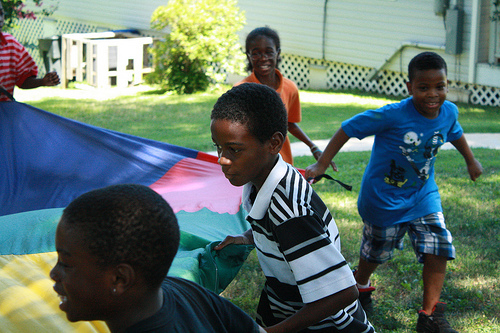 The day camp for Allendale children held this summer set attendance milestones and kept the Action staff and volunteers hopping. Fifty-seven children came to the camp on its busiest day, while attendence ranged from 30-40 on most days. “I just loved coming out onto the porch of our house on Yale during camp and seeing tons of kids interacting and having fun, with laughter in the air,” said Joan Pingel (Allendale), who led the effort. A staff of five worked all summer on the camp alongside Action volunteers. The girl campers made crafts, cooked and learned praise dancing, while boys had a Pinewood Derby-type competition and built a water rocket-launcher. All the campers learned about Acts of the Apostles. The camp made use of a small brick house renovated by last summer’s Action teams. Staff member Sam Mertz (South Bend) says one of his highlights was leading eight boys on a fishing trip to Cross Lake, an 8,500-acre lake about three miles away. Some of the boys had never seen it, and one boy was so intimidated by the water that he didn’t want to leave the van, much less get close enough to the lake to fish. “If I fall in, I’ll die,” the boy said. Sam prayed with him for courage and he finally left the van. By the end of the trip, he was happily fishing and saying that he wanted to come back again. Allendale boys play with a parachute. Colleen Murray (Allendale) remembers a breakthrough with a girl camper who refused to participate in a knitting project. “I don’t want to do it! You can’t make me do it!,” she told Colleen. “How about we set the timer for five minutes and I’ll help you for that time,” Colleen proposed. The girl got the knack of it quickly. Colleen eventually turned the timer off and the girl kept on knitting while Colleen read aloud to the other girls. For the rest of the summer, the girl asked to knit whenever she had the option and even asked her mother for a knitting kit. Patti Deakin (Allendale) met one of the girls walking home from camp one afternoon. “I asked her how her day was going and she said fine. I had seen her earlier and she was acting grumpy and sad. She said she had been really down when she got to camp, but now she was happy. I asked her what had made the difference. She said, “I remembered how Jeanette Zimmel had told me that I could choose to be happy or not. So I’m deciding to be happy. I really like it.” Camp staffers have been teaching this for years, and this girl was attending her fourth camp, but that day she suddenly got it. Neighbor Claudia Stephens said she appreciated all the care Action team members showed by walking the neighborhood children to and from camp each day. 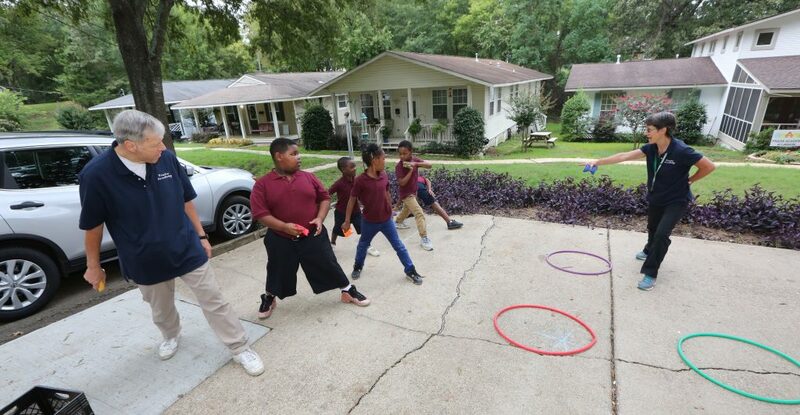 “I want my son to come to camp because of the difference I’ve seen it make for my neighbor’s son when he hangs around y’all,” another neighborhood man said. This story blesses my heart. The fishing trip though makes me wonder. Do any of the children there know how to swim? This article was inspiring! I'm so grateful you're doing this work and teaching so much to the young. The Lord is glorified in this and your faithfulness! We keep all in prayer and rejoice in the Lord for these days of wonder! 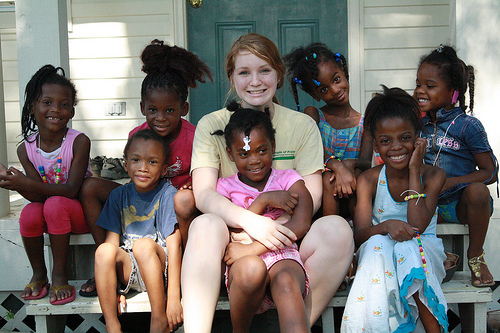 Camp staff, because of your efforts and persistence, we are making a difference in the world. Thanks. I'm so glad my Dad and I were able to witness this first hand at the end of June. We stayed for two nights and when we departed, my Dad (not a member of POP but knows the Lord) kept telling me how impressed he was by our life in Allendale. I so enjoyed the three hours I spent helping with the 8 year old group of boys. Way to go Colleen (and all the rest of you)!! 7-8 years of work and we are beginning to see some fruit. YEH GOD!!!! Thank you God!!!!! It builds my faith to read this account of summer camp 2011. What a delight to see hearts and attitudes change! Only the Lord knows the positive and long-reaching effects that you People of Praise-Allendale brothers and sisters are having on the local culture! May you--all of you who spent any time in Allendale--receive the fullness of the Lord's blessings!! And thank you "News Staff" members for the stories!! God bless Allendale Camp! What a life changers for so many young and a powerful witness to the world of the Father's love. Thank you all in Allendale for your "yes" to the Lord. May you continue to shine brightly in the neighborhood!